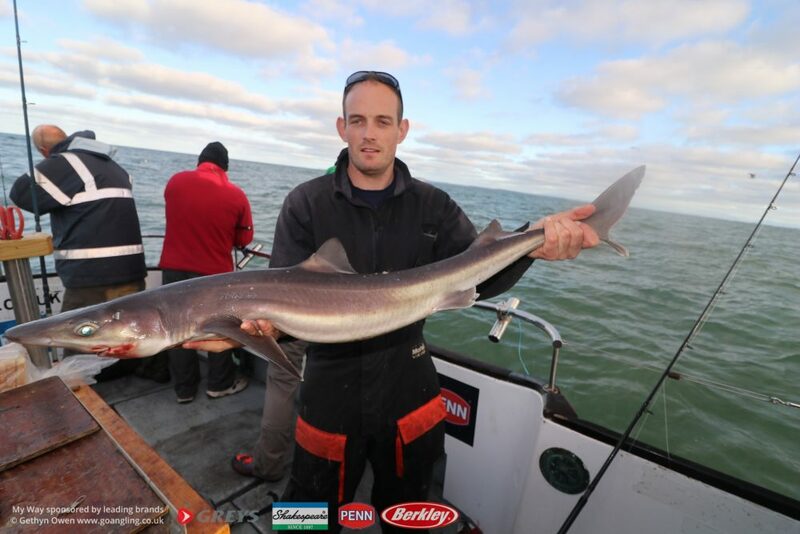 Friday 27th October saw us fish the final day of our Pure Fishing summer & autumn species competitions. 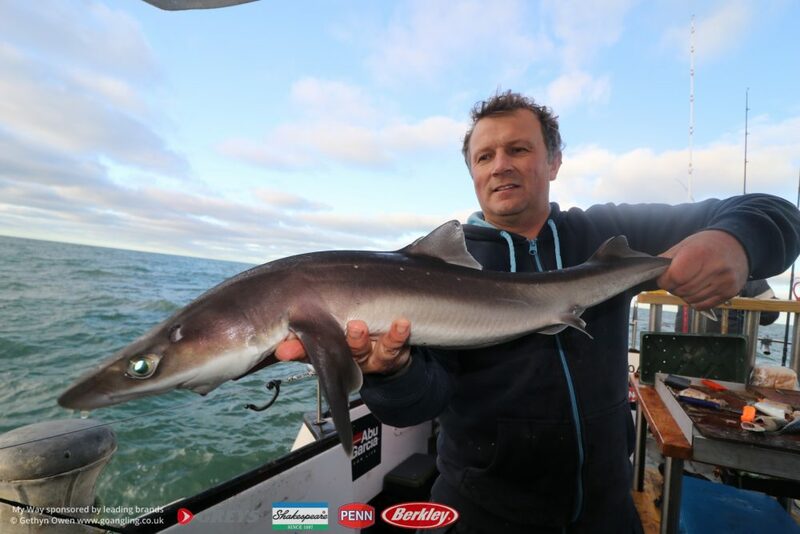 The first leg was fished on October 6th, which saw Wirral based angler Micky Duff set a commanding points lead of 175 to all those fishing the 2nd day in the hope of winning the Greys Uptider and Penn Fathom 20 reel available to the winner of the most points. Our day started off with a change of plan, we had hoped to head straight out to Holyhead Deeps and fish the last of the ebb tide for possible spurdogs. Sadly the 18mph northerly winds restricted us to fishing inshore. However with a decreasing forecast, fingers were crossed for the high water slack in the afternoon. 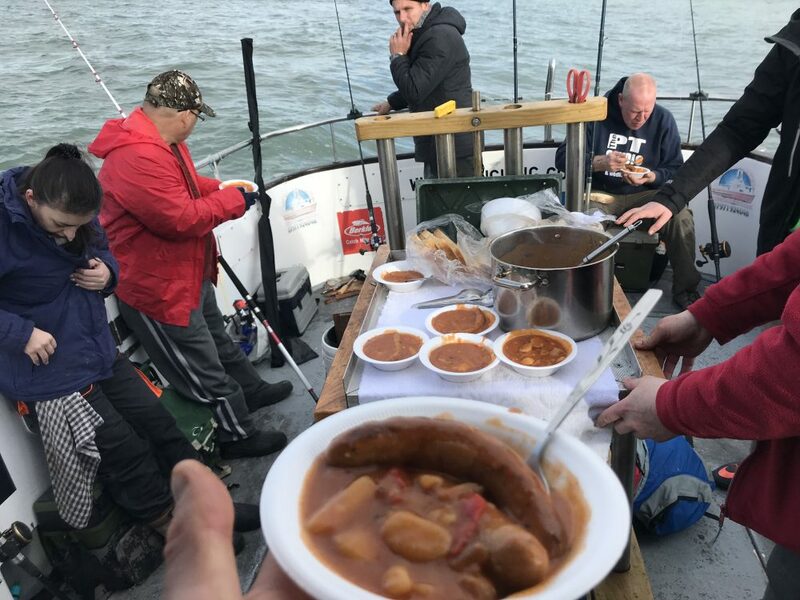 Instead all 8 anglers prepared rigs and baits for a couple hours on the mussel beds, a productive patch of ground north of Holyhead. 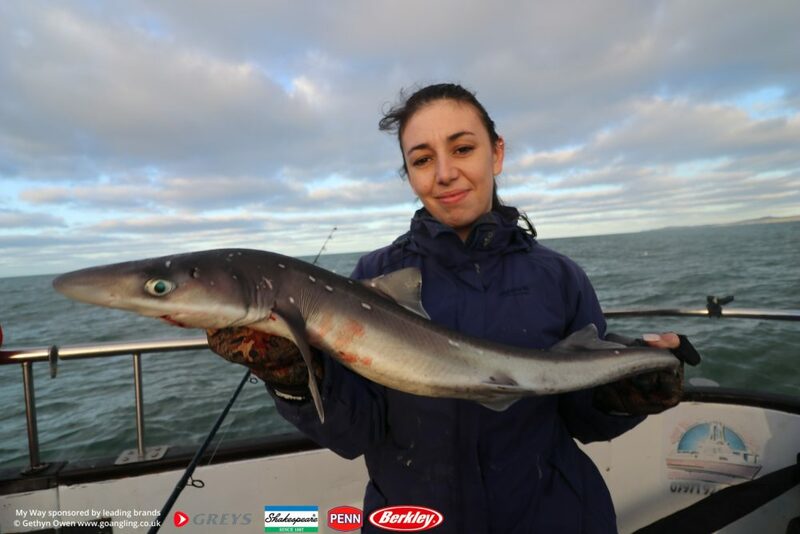 Fishing was hectic, with all anglers hooking into late autumn staples dogfish and good sized whiting. As the tide eased, the huss started to bite, with sizes ranging between 3lb and a few into double figures. 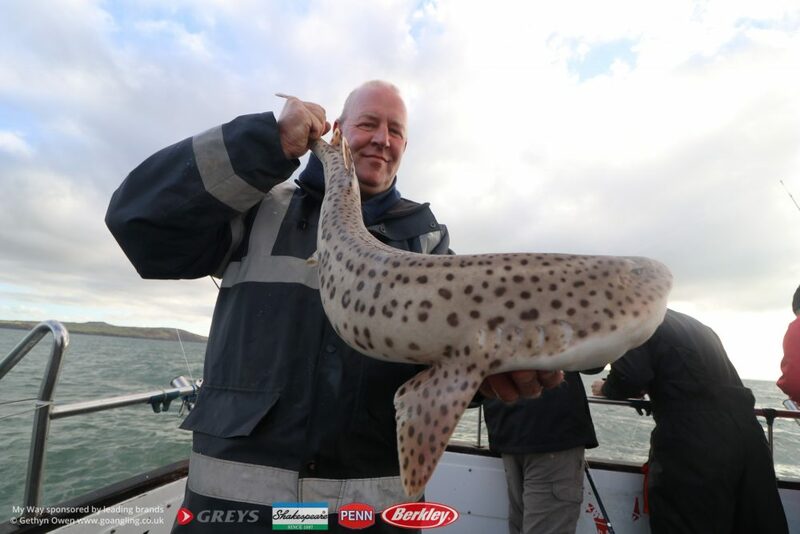 There was mixed experience aboard the boat, a few regulars along with some anglers new to fishing aboard My Way. Alf, Zukia and Mark Cain had all fished the first leg of our October competition early this month and were determined to come closer and possibly beat Mickeys score. 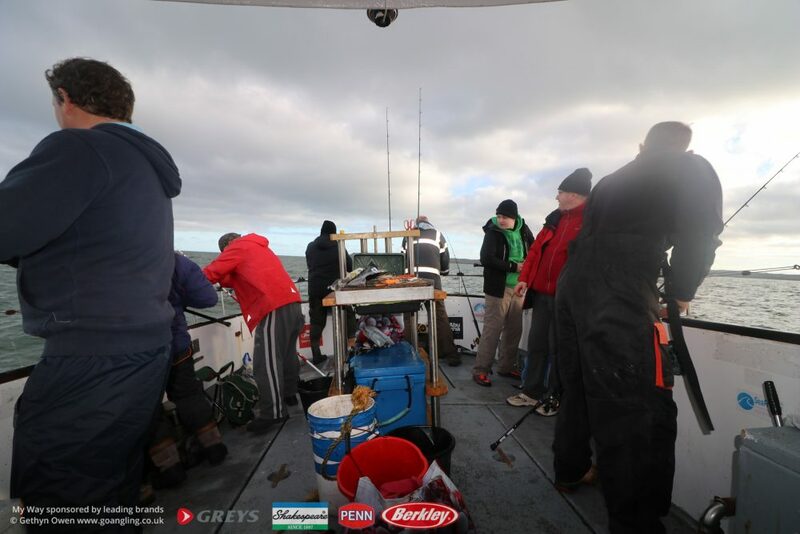 Mark had battled hard with Micky during the first match, similar points for most of the day, Mickeys match experience of pulling in numbers of fish continually through the 8hrs afloat helping him seal the win on that first day. What was nice to see on 27th, was that having been beaten by Mickey earlier in the month, Mark had noted the rigs that were being used to defeat him. The rigs he was using on this day were very similar to those that Mickey had on 06th, so effective Mark was landing double and triple shots of fish on a regular basis from his bow position. There is no shame in losing when fishing a match, what would be shameful would be to not learn from that experience. Mark had certainly learnt and was making that experience work for him with great effect this day. 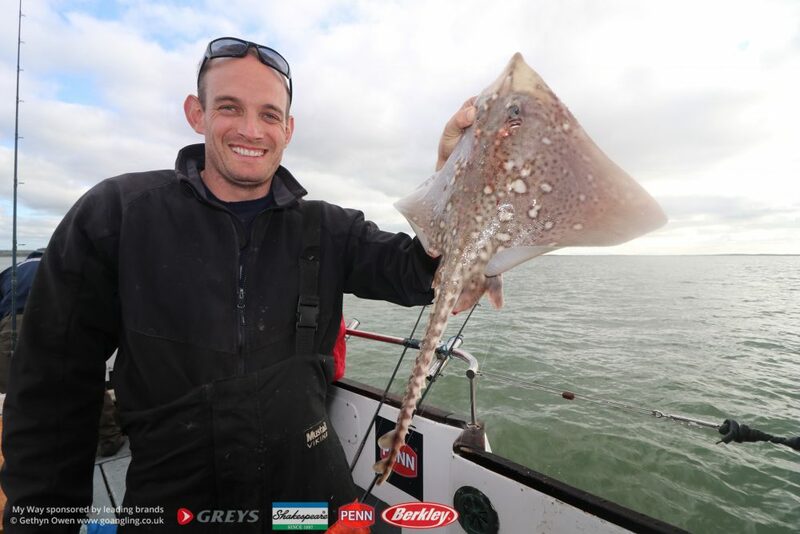 Mark managed a bonus fish on the mussel beds when he pulled out a small thornback ray. With each new species worth 6 points and 5 points for a ray, a cool 11 points were added to his score sheet. On the stern another regular My Way angler Keith Heaton was plodding away with a constant number of fish, but also a very credible number of bull huss. 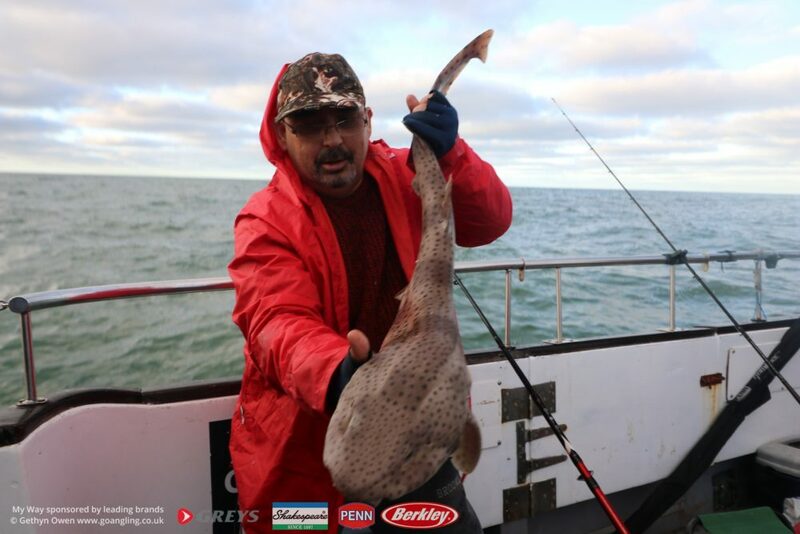 With huss scoring 5 points to the 1 point of a dogfish or whiting, Keith was hot on the heels of mark for most of the day. These competitions are fun events and there is never anything too serious about them. They are in effect just a normal day afloat catching plenty, the only difference being that I score each fish that you catch on the card and total the points up at the end. As well as the main competition, there were also a couple personal matches going on the boat. Father and son Jason and Luke, naturally wanting to beat each other and Alf, having lost to daughter Zukia on the first October competition, wanting revenge despite this being his birthday treat to Zukia. Our stint on the mussel beds yielded a good number of fish, the bags mainly consisting of dogfish, whiting, pout an poor cod, but also a brilliant 40 huss between the 8 anglers. As the tide started to increase, we moved inshore to Church Bay. Here the fishing slowed down slightly, with more singles and the odd brace of fishing coming aboard. Whiting and dogfish again the main catches with a few dabs, poor cod and a solitary coalfish too. With the slower fishing, it was an ideal time for lunch. Keiths wife Dawn had made a fantastic sausage casserole for everyone to enjoy. And it was delicious, not a spoonful left with Mark Cain going in to wipe the pan clean with a few slices of the crusty white bread that accompanied the meal. By early afternoon, the wind had eased and the sea flattened off nicely and we decided to head off to Holyhead Deep in search of more huss and possibly spurdogs and eels. With the poor weather we’d had of late I’d not been out to the deeps for over a month, spurs were due to make an appearance once again, but to say I was apprehensive would be an understatement. We pushed out a little further than usual, fishing at anchor in a depth of 220foot. Fortunately the plan worked, Chris Firth was first to hook into something and with over a knot of tide still running it was putting up a fight. 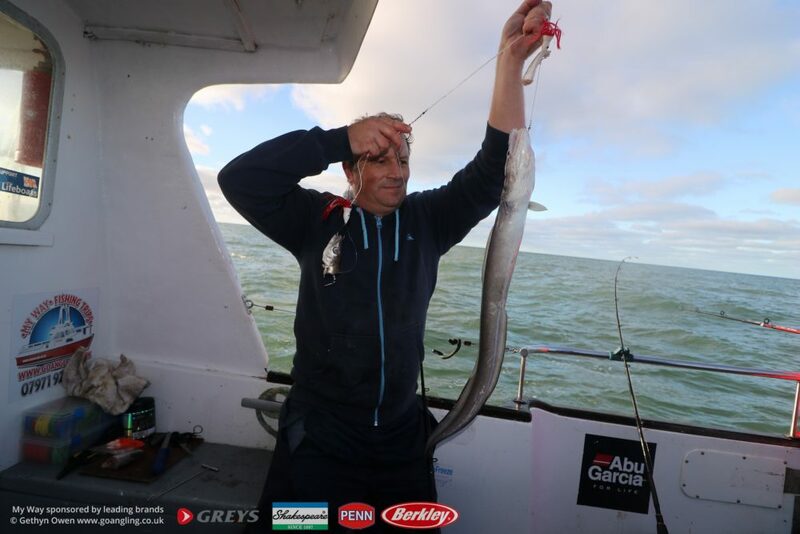 Thoughts of spurdog came quickly with the constant shake on the rod tip, it turned out to be a strap conger, a first ever eel for Chris. A few huss came aboard before the spurdogs moved in. Everyone caught plenty of spurs, many of which well into double figures. Following his eel, Chris managed 5 spurdogs of his own. 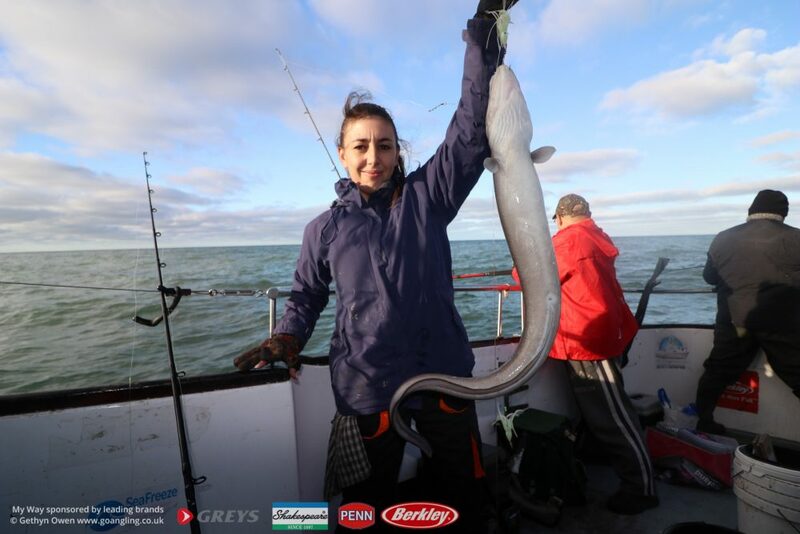 Zukia, having not caught an eel or spurdog before managed to knock both off her species list this trip. The first spurdog dropping off at the side of the boat but thankfully with the rig rebaited and dropped down another quickly followed. Mark hooked into something quite lively from the depths, it looked to be a good spur or small tope, but when it broke the surface it was another conger, a nice eel just shy of 20lb. 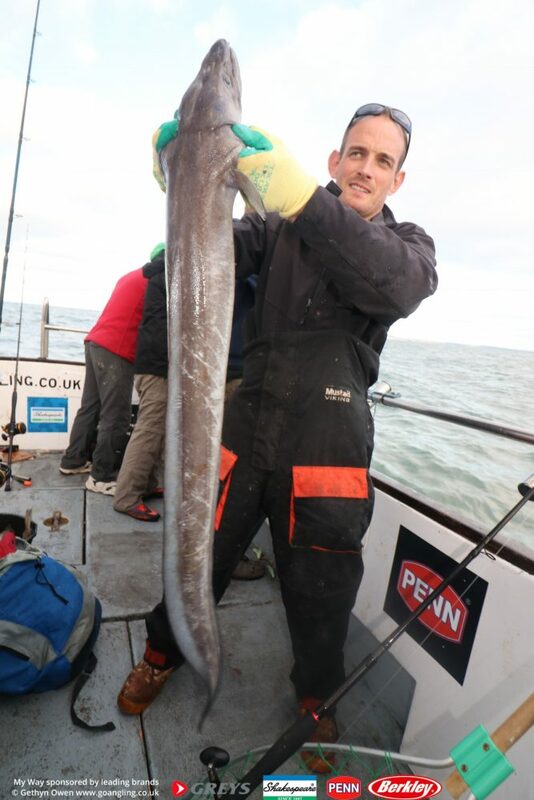 Marks heaviest eel to date. 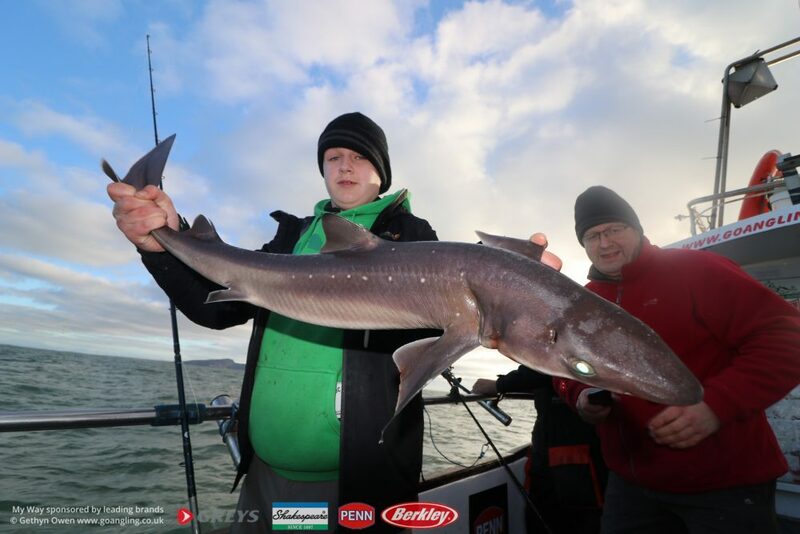 Luke was on form in the deeps, huss and spurdogs keeping him busy, catching a bigger spurdog than his father, raising a faint smile when lifting the nice double figure shark up. 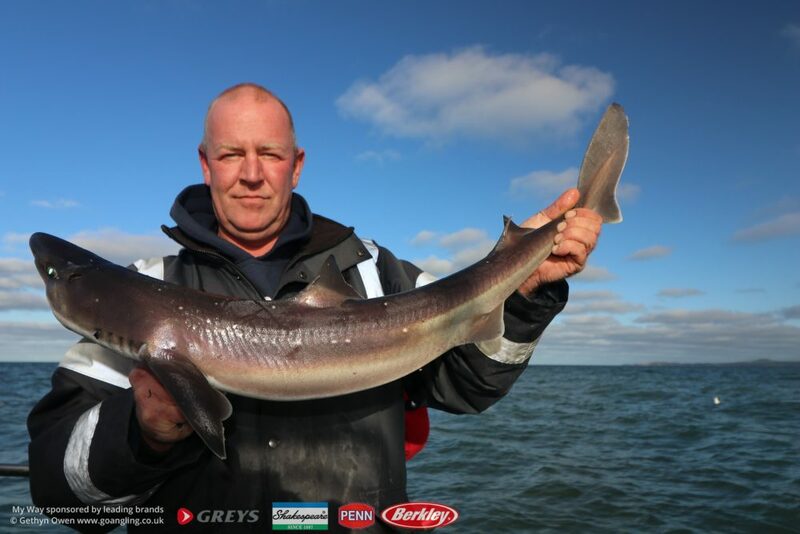 On the final count after lines up, Mark Cain had proved himself a worthy winner for the day and to cap it off, with his fish numbers and 9 species he’d amassed 189 fish points, winning the October competition and a brand new Greys uptider and Penn Fathom multiplier for his efforts. Marks win did have us all laughing, as he won using a brand new Greys GR100S 20lb boat rod and Penn Fathom 15 twin speed that he had purchased only the day before from ABC in Beaumaris. Mark had tested the GR100S & Fathom 2speed outfit aboard My Way a couple times previously, before deciding to buy. 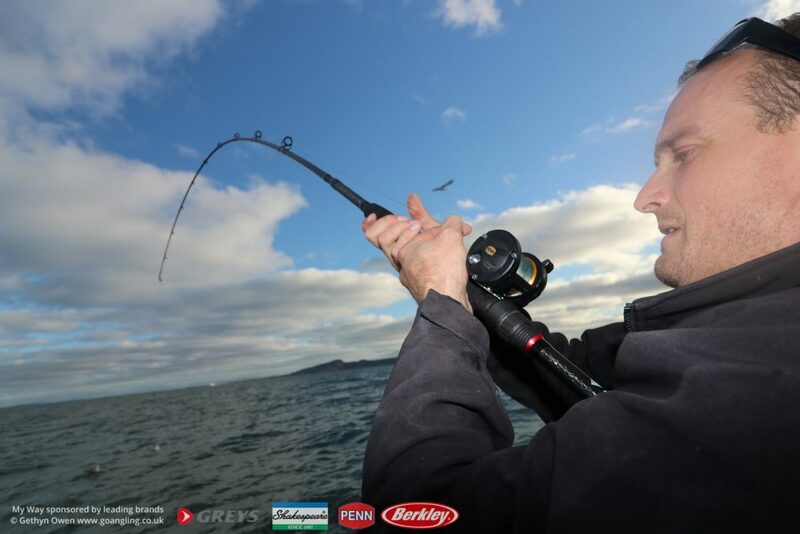 A great set up that worked well for him during this match … he now has two fantastic brand new rod & reel combos, well done! 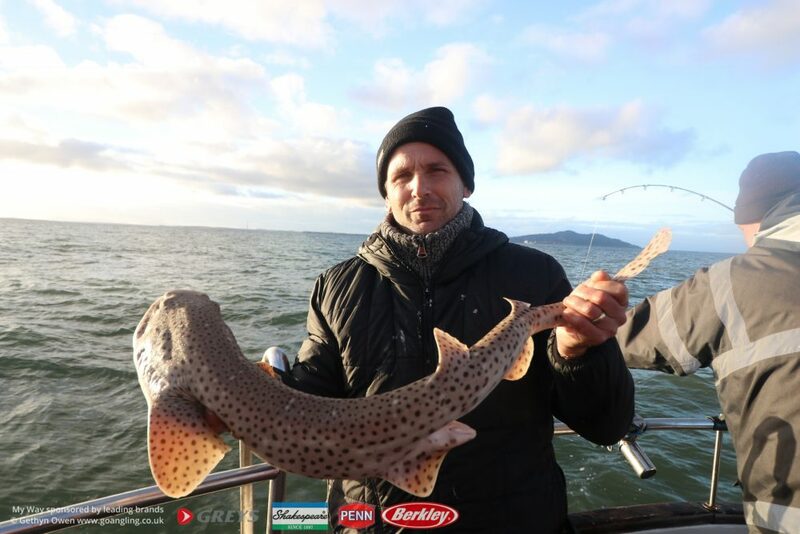 The match was well fished, plenty to be caught a variety of species, some great food and some good laughs too. A very big thank you to My Ways sponsors Pure Fishing (UK) Ltd. They have sponsored some great competitions aboard My Way through 2017 and have helped many anglers walk away smiling, not only with competition prizes but with the excellent quality rods, reels and lines used by novice and experienced anglers alike when fishing with us.